"And lo, the three dark divinities returned, and as they felled the gods, the Hour of Promise arrived. 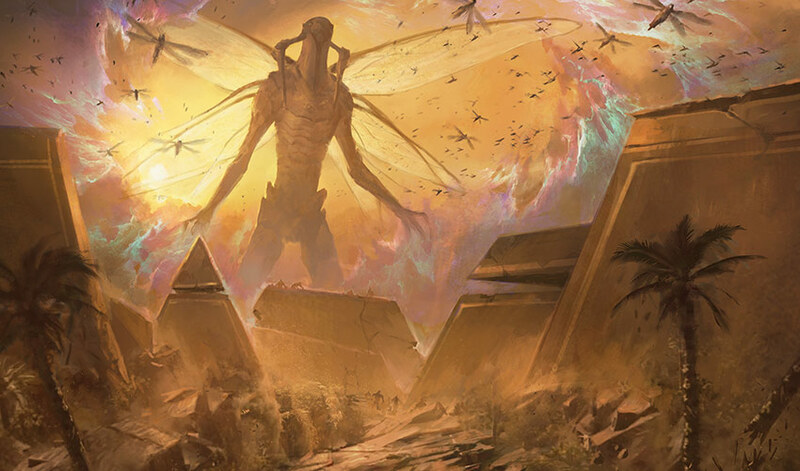 And so the great locust god fulfilled the great promise, and thus the Hekma was torn asunder, its protections cast aside before the return of the God-Pharaoh." Hapatra stood on the steps of the Temple of Strength, watching the blood of the Luxa seep upriver, transforming the water to crimson as its stain spread. Her arms were crossed tight in front of her chest, and her mouth was a hard line. The other viziers of the temple flanked her on either side, sharing her fixation with the dry riverbed and its crimson stain. Khufu stood to her right. He was broad-shouldered and bulky, with a patch of gray sneaking across his temples. In a happier moment, Hapatra would have teased him for his age (a ghastly thirty-five), but now all she could do was shake her head. "We should have news of the new gods' intentions by now," she said. "Where is Iput?" "Returning swiftly, I'm certain," Khufu said, faith ringing through his voice like a chime. Hapatra toyed with the pet snake wrapped around her little finger. Earlier, a messenger had come to say that three new gods had appeared, and that one had engaged Rhonas in combat. She wished she could stand alongside Rhonas to greet the newcomers, but the viziers had agreed in the moment that it was best to stay at their temples. Hapatra pursed her lips. She was as anxious and desperate for news as the rest of her peers. "We should be near Rhonas for the Hour of Glory." Khufu crossed his arms. "The Hour of Glory is the time when gods and mortals alike will prove their worthiness to enter into the glorious Afterlife." Hapatra made a small noise of confirmation. "So the new gods will test them first? Then move on to us and the untested initiates?" Hapatra shifted from foot to foot, letting her little pet slide from one hand to the other. Her heart beat with anxiety. She knew in her heart that Rhonas's victory would be swift, but waiting for news was proving to be torturous. "The prophecies have always been unclear about where we were supposed to be for all of this. How will we know when to lead the untested initiates to the new gods? And what does the river turning to blood have to do with it?" Hapatra frowned. Khufu held up his hands, palms facing upward. "The God-Pharaoh will make all clear." May the God-Pharaoh's mercy be more bountiful than his communications, Hapatra thought to herself. She let her gaze drift back to the River Luxa. The birds had stopped singing, and the city, usually rife with the sounds of happy training, was utterly silent. It made Hapatra uncomfortable. Even more concerning was the retreating water—blood—of the river. The empty riverbed was filled with undead fish. Strange, lumpy, blood-soaked animals flopped on the mud and rolled around lamely. The Curse of Wandering did not care that they needed water to move after all. It was all too strange. Too unorthodox. These prophecies were vague, and their manifestations unsettling. Foreign doubts ghosted through Hapatra's mind. She dared not give them names. Without warning, her breath hitched in her throat. A sudden, jarring pain burst in Hapatra's chest, and she doubled over in agony, clutching her heart and cursing through the sting. She looked around desperately for the source and saw that the other viziers were clutching their chest as well. She stilled her mind and tried to work her way through the ache. Hapatra was a master of poisons and had spent much of her life forcing her body to work through searing pain. She breathed in, then out, focusing on her will to ease the panic and hurt from her body. The physical pain passed, but a feeling of dread remained. Parts of the city were screaming. Hapatra looked out over the rooftops and temples to find the source. The sound seemed to be coming from the Gate, but grew louder to her ear, as if something were traveling rapidly over Naktamun. In the distance, Hapatra saw Kefnet take to the air, followed by a strange dark shape she did not recognize. From above, she heard something odd—a chittering, scratching, leggy little noise creeping through the haze of the Hekma. Hapatra looked up and saw a cloud of locusts hovering above. The monsters were meant to have been vanquished with the Hour of Revelation. That was why the demon had arrived to fly over the city; he was the driven out of paradise, as were all beasts outside the Hekma. Why did the monsters persist? Her snake slipped off her finger and slithered into a crack in the temple wall. Hapatra looked back toward Kefnet and realized that the dark shape following him could only be one of the new gods. It was massive. The thing seemed to be climbing the nearest tower. Its claws gripped the rock sides of an obelisk as it hauled its enormous body upward. Halfway up the thing appeared to remember it had wings, launching itself quickly to the top. The drone of its wings was a constant, violent noise, as though the air itself was protesting the constant beating inflicted upon it by the gigantic insectoid wings. The other vizier shook his head, still wincing from the mysterious pain. "This is all part of the Hour of Glory. The gods will be tested as we will." "And that is what that pain was? A test?" Khufu nodded, and Hapatra's lips curled. She crossed to the opposite side of the veranda. Nothing about this felt right. At that moment, she heard small footsteps coming up the stairs. Iput, the Temple of Strength's youngest and most fleet-footed vizier, ran swiftly up the stairs. Her face was a mess of tears. Hapatra kneeled and caught her in her arms. "Iput, what did you see? What do the new gods want?" "Rhonas is dead!" she sputtered. Hapatra's face fell. She shook her head. "No. He is a god. The gods cannot be killed." Iput shuddered with grief. "The scorpion god killed him. It means to kill them all." Rhonas was the mightiest of the gods. Beasts shied away from his power, and dark forces quailed wherever his shadow fell. Rhonas could not be killed. But the pain in Hapatra's heart said otherwise. Behind her, Khufu was yelling. "It is a test! Iput is lying! Rhonas, greatest god of them all, will join the side of the God-Pharaoh—"
"Would you be silent for once!" Hapatra yelled. This was no time for protocol. Promises had been broken, and trust had been pierced with unfamiliar venom. Hapatra could grieve later. Her only goal now was to keep the other gods safe so no other citizen would feel the pain of a god falling. Hapatra looked up and saw dark clouds of insects clinging to the inside of the barrier. She looked to the locust god on the spire in the distance in time to witness it, arms outstretched, wielding some unholy magic directed at the sky above. The buzz of locusts filled the air above her. A gray mass was coalescing on the inside of the Hekma. 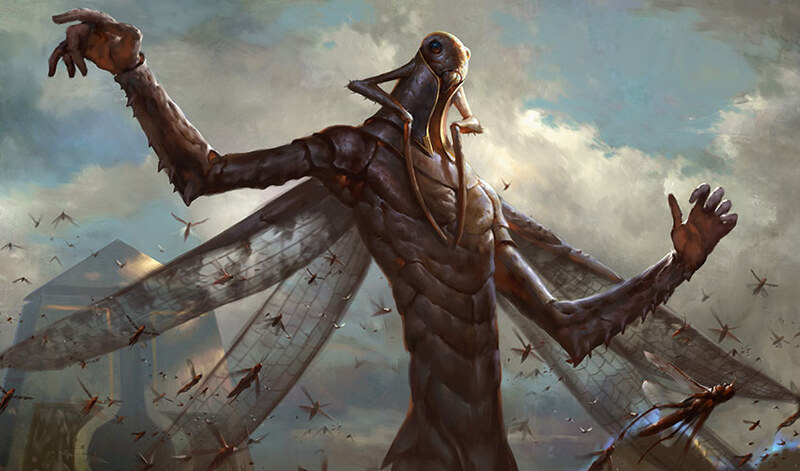 At first it was sparse, but as the locust god's spell continued, the mass grew larger and larger, and the drone of buzzing wings grew louder and louder. Hapatra narrowed her eyes to make out what the locusts were doing. They seemed to be clambering over each other to reach the shimmering magic of the Hekma. And as they moved, shafts of clear light broke through where the barrier used to stand. Hapatra's lips parted in horror. The locusts were eating away at the Hekma itself. Hapatra turned to the other viziers. "The Hour of Promise is when the world will be transformed into a glorious paradise. 'No more will the Hekma be required to hedge out the desert and the marauding dead, for the waters of the Luxa will flow freely through the wastes.' Right?!" The other viziers nodded their heads. Hapatra jabbed a finger at the locust god in the distance. She drew back her shoulders and stood at full height. "The Luxa will flow freely through the wastes because there won't be a Hekma!" The viziers looked up in horror. They watched from their high vantage point as the locusts consumed more and more of the magic that kept them safe from the outside. Even Khufu couldn't help but look. "The locust god is doing this . . . ?" The Hekma was coated with locusts beyond count, their swarm so thick that the light of both suns flickered and dimmed. An eerie, black night fell on Naktamun. Hapatra blinked as her eyes adjusted. The mass of insects moved and shifted, dappling light on the stones of the Temple of Strength. Hapatra decided this was about the right time to go inside. "No more gawking! Everyone retreat!" Hapatra called. The other viziers were swallowed by their grief, and reluctantly picked themselves up off the ground with desperate sobs. Hapatra whipped around. "Rhonas would not want you to sit and mourn! Arm yourselves for battle, viziers!" The others sniffed and nodded, heading inside to retrieve their weapons. A pinprick of light escaped through the dark mass of insects above. Shafts of light broke through across the underside of the barrier, at first several, then a dozen, and suddenly a quarter of the Hekma barrier vanished. The city erupted into chaos. She watched from the temple as Kefnet flew upward and began a spell to repair the Hekma, but his effort was in vain. Swarms of locusts mobbed the god, and Kefnet struggled to continue the enchantment under the assault of hundreds of thousands of insects. Hapatra cursed the limited view she had of the rest of the city. As the surrounding Hekma vanished, a wave of marauding mummies poured into the city from the wastes beyond. She turned heel and ran as quickly as she could into the Temple of Strength. Initiates were panicking, hugging each other for comfort. Some viziers were arming themselves; another was leading the beasts of the temple out of their habitats to let loose into the city to fight off the marauding mummies. The inside of the Temple of Strength was an extensive training ground known as the Holding, a carefully curated wildlife preserve designed as a place where initiates could hone their tenacity and survival skills. Hapatra began working her way through the outer ring of the Holding toward its more perilous inner ring. She had spent her entire life devoted to this Temple, and knew every path and shortcut. The vizier's chambers were very near now. Hapatra did her very best not to let the turmoil in her heart show on her face. All she had ever wanted was a place by Rhonas's side in the Afterlife. Where would gods go when they died? Her own chambers were shrouded in poisonous vines. She passed through with tingling ease and ran toward her weapon cabinet. Spear. Scimitar. Vials upon vials of poisons. Hapatra remembered a lesson she had taught just months before. She stood encircled by initiates, each healthy, talented, and poised for success in the Trial of Strength. As master of poisons, Hapatra delighted in teaching her craft. She gestured with a lift of her proud chin and asked the group of students a simple question. "How do marauding mummies move through the sandy desert?" Hapatra waited for a beat and then broke into a dazzling smile. Every initiate groaned, and Hapatra grinned with smug satisfaction. Hapatra smiled at the memory and pulled out a vial of poison. She knew full well how mummies moved. Once the Curse of Wandering took hold, the muscles animated through impulses that were sent through the spinal cord and nerves to the muscles. She smeared poison on the edge of her scimitar. Hapatra punctuated her quip with a shrill whistle. Something massive rumbled past the opening to her chamber, and Hapatra smiled wickedly. She grabbed a thick shawl to protect her skin from the locusts and called out to the thing outside. She heard a hiss from behind the vines. Hapatra slung her scimitar over her back and moved the vines to the side, cooing at the huge basilisk in front of her. Tuya was twice as tall as Hapatra and longer than she had ever cared to measure. The two shared a magical bond, and the basilisk nuzzled the hands of her master. Hapatra kissed the nose of her serpent. "The world as we know it has ended, old girl," Hapatra whispered. The basilisk snuggled her nose into the crook of Hapatra's neck. The master of poisons swallowed her grief. "No time for mourning, sweetheart. We have a city to save." Hapatra clung tight to Tuya's back as the serpent wound its way through the rings of the Holding. There were no initiates in here now, and the wilderness was strangely empty. Hapatra extended a hand and wove a spell of calling. To me, she projected. Follow me outside and avenge your master, for he is dead. The beasts and animals of the Holding lifted their heads attentively. They began to follow, first one, then many, until a mass of antelopes, hippopotamuses, rhinoceroses, and elephants were following the slithering basilisk. Vines and leaves whipped Hapatra's face as she barreled through the jungle of the Holding. She tugged at Tuya's side to steer the basilisk up the central staircase, shutting her eyes tight as they broke through the doorway into the terror of the brilliant light of day. The light hit her face at the same time as a storm of screams and noise. Free of their task, the locusts were swarming whatever body they could find first. Cursed dead had begun to wander in from the desert outside, and a few horrors from the wastes had started to attack any living person they could find. Naktamun, once shining alabaster, was stained with plague and beasts. Hapatra could feel locusts bouncing off her even through her thick shawl. She brought Tuya to a halt, and the menagerie of animals from the Temple of Strength following behind stopped in turn. The suns above were dappled with clouds of insects. Kefnet hovered far above now, desperately trying to rebuild the Hekma. In the distance, Hapatra could make out the locust god still standing atop its spire, setting wave after wave of locusts upon a hapless Kefnet. Hapatra quickly wove another spell of calling. Attack the pretender gods! Kill the insectoid trespassers! The beasts roared with bloodthirst and fury, and Tuya reared up to bare her fangs. Hapatra drew her scimitar and willed Tuya to charge. They tore through the streets of Naktamun, ramming as many marauding mummies and locusts as possible. Hapatra leaned over the side of her serpent and sliced through the chests of several mummies with her poisoned scimitar. With every swipe of her blade, another mummy halted, hunched over, and fell to the earth, its body seizing and shaking. If only Rhonas could see me now, she thought with a bittersweet smile. Tuya's fangs clamped down on the bodies of several marauding mummies, and Hapatra leapt to the ground. "Keep the cursed dead out of the city!" she yelled. The basilisk gave her a quick loving flick of her tongue and slithered away to the edge of Naktamun. Hapatra looked up, spotted the struggling Kefnet high above the city, and ran toward him. 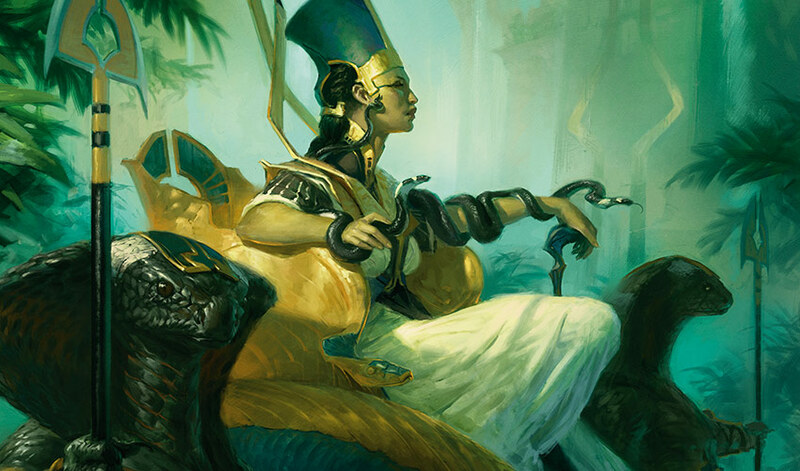 The shawl prevented the locusts from biting and scraping her skin, but Hapatra quickly realized it would be no help against the mummies that surrounded her now. She charged forward into the throng all the same. She started to intone a prayer to Rhonas before catching herself and cursing. Yet still she wove her way through swaths of enemies, her blade dancing with a practiced, deadly grace as she cut herself free from the crowd of undead. She knew that her poison would freeze the mummies on its own. Hapatra ran toward the nearest group of marauding dead and began to make as many cuts as possible. Her poison would cease movement on both the living and the dead. She could not remove the Curse of Wandering, but she could make it a hell of a lot harder for them to wander in the first place. Hapatra cut slice after slice, leaving a trail of seizing corpses in her wake. She lost herself at that moment. Moving her blade side to side, with locusts disrupting her vision and buzzing filling her ears, Hapatra felt old. She had lived for thirty-four years—two lifetimes' worth of experience. Rhonas had been there for her from the very start. He was so good and so true. How could her god betray her like this? No. It wasn't the gods. It was the one who was absent. The God-Pharaoh who was not here. Hapatra screamed in fury and sliced the head of a marauding mummy clear off. A flash of gold caught her eye. Hapatra looked over and watched as two children stood back to back against a group of decayed mummies. They stabbed with stolen spears and yelled tactical advice to one another. Their movements were unskilled, channeled from a place of abject terror. Hapatra's heart felt heavy. She charged forward and made quick work of the attacking mummies, with the two children stabbing and screaming alongside her. Once their enemies had fallen in a poisoned heap, Hapatra turned to the children. "They won't stop," replied the older child. Hapatra's brow fell in confusion. She kicked in the door of the nearest house and walked inside. Several anointed were preparing lunch in the kitchen. Mounds of food piled up on all sides and each bowl was coated with feasting locusts. The stink of insects and tainted food was thick in the air. One anointed mummy had run out of bowls to put food in and was simply dropping it, spoonful by spoonful, onto the floor. A mass of locusts busily consumed the extra food, but the mummies took no notice. It appeared the anointed were unable to stop their duties despite the chaos that permeated the city. Hapatra recoiled and exited quickly. She knelt to the level of the children and pulled out a vial of poison. "Give me your spears," she instructed. The boys handed over the spears, and Hapatra uncorked her poison, applying it to their blades with her fingers. "Find some adults and stay near them. Slice as many marauding mummies as you can with this." A scream caught her ear. Hapatra stood, drew her scimitar, and ran toward the sound. Locusts were mobbing the body of a man while a woman stood at his side, smacking the insects away with her hands. The slap of her fingers was drowned out by the incessant drone of their wings. Hapatra realized she was standing by a fountain in her favorite courtyard. The fountain had pulled water directly from the river. It was stained with blood now. Hapatra felt a tug at her heart, and Tuya rounded the quarter of the square, her massive scaled body smacking into the walls with indelicate force. Her snout was coated with blood and the viscera of dead insects. Hapatra climbed atop her familiar and urged her forward. Kefnet was perched atop a tower nearby, his wings drooping with fatigue. Hapatra pushed Tuya forward, and they slid through the city with ease. More citizens were fighting back now, and a few had encouraged their anointed to do the same. Every now and then, Hapatra passed one of the beasts from the Holding; they tore and bit and scratched at the intruding mummies. Some noticed as the basilisk passed and ran to tag along. Hapatra halted Tuya, looking for whoever had called her name. The heretic Samut stood below. "If you're here to say 'I told you so,' I don't want to hear it," Hapatra yelled down. Samut shook her head. She looked to her left, and the champion Djeru came around the corner. "We need to find and protect Oketra," Samut said. "We . . . we saw Rhonas fall." Djeru shook his head. "We cannot let the other gods suffer Rhonas's fate." The two former initiates gracefully climbed atop Tuya, and Hapatra urged the basilisk forward. Hapatra mused as the basilisk travelled. "I always understood the Hour of Promise to mean that the Hekma would fall to reveal paradise." "It is all part of the God-Pharaoh's lies." Samut's mouth was a hard line. Djeru shook his head behind her and remained silent. Hapatra petted the cool scales of her basilisk. "Serving Rhonas was my purpose in life. I refuse to believe he knowingly lied to us." "He did not knowingly lie to us. The gods were manipulated by a more powerful force." Hapatra nodded, considering this. She looked over her shoulder and met eyes with Samut. "Can this force be killed?" Samut shook her head slowly. "I don't want to find out." "For someone who claims to know so much, your vision is narrow," Hapatra snapped. Djeru piped in from behind. "Keeping our people and gods alive is paramount. Let the trespassers fight each other." Sure enough, two of the trespassers came rushing across their path. One was Gideon, the broad-shouldered warrior Oketra had claimed as one of her own. The other was a pale woman in a violet dress. "Don't stop for them," Djeru spat. Hapatra looked back for a last glimpse at the strangers. There were no other cities save Naktamun, and yet these trespassers knew nothing of its culture. The day before yesterday, she had received word through the viziers that the gods were welcoming these guests. Hapatra sneered. Let the trespassers deal with the God-Pharaoh. If he is from a different world as well, then they all deserve each other. A gust of wind blew a new cloud of locusts over the basilisk. Hapatra huddled the other two close against her back and shielded them all with her shawl, then looked down the thoroughfare. Kefnet and Oketra were there: Kefnet hovering in the air, Oketra solid, unmoving, almost a statue save for the flick of one ear. As a servant of Rhonas, Hapatra had never had much appreciation for Oketra, but she found herself overcome with relief to be in the god's presence, grateful for the first warmth she had felt since Rhonas's death. The two gods were looking at something behind her. Hapatra halted her basilisk and turned to see what they were staring at, but her view was blocked by broken columns, fractured stone, and the endless clouds of buzzing locusts. Hapatra looked back to her gods with a plea in her heart. "Kefnet! Oketra! The Hekma is lost! We will take you to safety!" Hapatra distantly realized how ridiculous this command would have sounded only a day before. Both gods ignored her, continuing to look off into the distance. Oketra's bow was in her hands, an arrow of white light nocked. "Oketra, please!" Hapatra called, voice cracking as she contemplated all that she had already lost, and all that was still left to lose. "Oketra! We will protect you!" The hole in her heart from Rhonas's death was already too large. She could not bear to see it grow. Oketra looked down at her. Her pale eyes glowed softly, and Hapatra basked in her familiar calm. The God of Solidarity looked down on Hapatra and smiled, sad and small. Around Hapatra, the sounds of people fleeing in terror abated as the god gazed into her soul. "You are not here to protect us, child of Rhonas." Oketra shook her head ever so slightly. "We are here to protect you." Hapatra's heart clenched. "Oketra, no!" But with those words of dismissal, Oketra turned once more and raised her bow. Kefnet flew higher in the air, and Hapatra was finally able to see what the two gods had been staring at. The beast was nightmare given form. It was more immense than any monster she had seen through the Hekma in the wilds of the desert. Tall, taller than any god, even Rhonas, which Hapatra would not have thought possible. It had the body of a man and the head of a scorpion, but one that somehow stood upright on the being's body—and it was far larger and bulkier than any scorpion had a right to be. Dancing behind it, in a loose, rhythmic, weaving circle, was its stinger, the point glistening with ichor. Even the ever-present swarms of locusts gave the monster a wide berth, reluctant to cross its path. Hapatra could hear a loud chittering sound, though whether it came from the monster's mouth or its tail she could not tell. Kefnet looked back at Oketra, and Hapatra was shocked to see the god's fear so clearly written on his face. "Stow your terror, brother!" Oketra said with a finality that thrummed through Hapatra's heart. "Face this beast and wield your gifts in the ways of war!" Kefnet lifted his head. With a flex of his shoulders, he flew high and to the side of the scorpion. Oketra lifted her arrow again. "Turn back, god-killer, scourge of everlasting life, and you will live through this day." Oketra's voice rang throughout the clearing, her notes pure silver, though she emphasized this day in a way that made it clear she would be coming for her brother's killer eventually. She raised her bow, its white arrow now incandescent, burning hot. The scorpion swiveled its head to regard both Kefnet and Oketra, though if it spoke, Hapatra could not understand anything through the constant chitter chitter chitter sound it made. As the being came closer, Hapatra felt its presence and gasped. Her heart filled with terror as she recognized the scorpion god for what it was. Its divinity—though malevolent, an inverse of the other gods—was unmistakable. The three gods were still, sizing each other up as if captured in one of the temple friezes Hapatra knew so well. Kefnet flew at the scorpion god, darting in and out as he cast spell after spell. He disguised his dives in a series of illusions, massive birds and crocodilian dragons, each one catching the scorpion god's attention just in time for Kefnet to attack when least expected, narrowly avoiding the scorpion's sting. Oketra fired a succession of arrows, but somehow the scorpion god turned its thick carapace to intercept every missile. Oketra's white energy dissipated against its shields even as it attacked Kefnet with a blur of blows from its stinger. 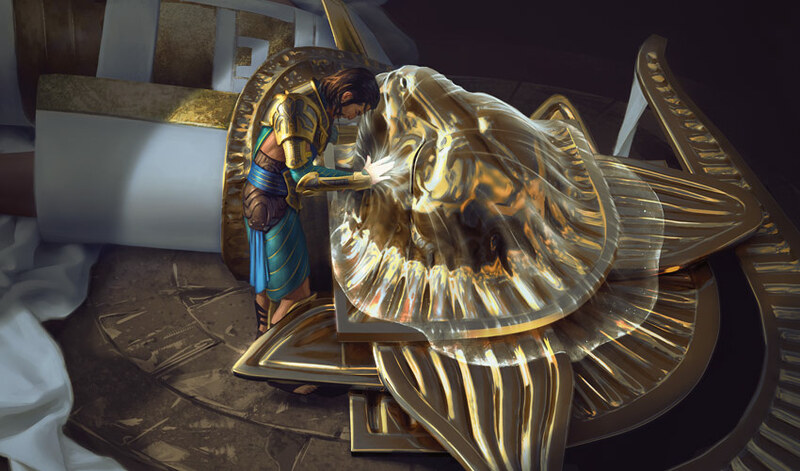 Kefnet soon ceased any attempts at illusory deception, for the scorpion god seemed never to take a wrong step or to mistime an attack. Many tales were told of Oketra's arrows striking down giant sandwurms and demons, and Hapatra was awed at the kind of power the scorpion god must possess to shrug off such blows, thick shell or no. She urged Tuya to keep to the shadows and soon found herself praying aloud to Oketra and Kefnet, shouting praise to aid in their battle. Kefnet flew higher to avoid the scorpion god's attacks, but the god immediately switched to focus on Oketra instead, closing on her with terrifying speed. Oketra was forced to backpedal furiously, her footfalls shaking the ground as Kefnet was forced to swoop back in to distract and harass the assassin. As deadly efficient as the scorpion god was, Kefnet and Oketra fought with a grace that Hapatra thought almost poetic. They moved in tandem with one another, their flurries of attack and counterattack timed precisely to expose a flank on the scorpion god's side or a weak spot in its armor. Although the scorpion god was so far undeterred, Hapatra knew she was watching two masters of combat, their cooperative technique honed over thousands of years of fighting. The scorpion god made several strikes, all misses, and quickly changed direction. Its sting had seemed to make contact with that shift—it must have grazed one of Kefnet's wings, for the ibis-headed god began to sputter through the air, one wing refusing to move at the same speed as the other. He faltered, and the scorpion god immediately took advantage, its stinger darting, each time narrowly missing Kefnet's head or chest. Kefnet, straining under the exertion, lurched from side to side in desperation. Oketra stood still at the edge of the thoroughfare, holding her bow aimed but still. She could not risk hitting Kefnet as he fought to stay alive, his body now interposed between her and the scorpion god. In his dance of survival, the ibis-headed god stumbled. The scorpion god rushed in and Kefnet's wings gave out. The scorpion god's pursuit was halted by Oketra's arrow of white light exploding through his head. The constant chittering sound vanished as the scorpion god, headless, crashed into the earth, its body flattening rubble into dust and the reverberations briefly lifting Hapatra, her basilisk, and its passengers off the ground. Hapatra watched as the body of the scorpion god crumbled to dust, whatever force had animated it no longer present. Kefnet straightened his wing and stood up, seemingly uninjured. He smiled wickedly at his sister, who shared his joy. The three humans cheered atop the basilisk. They praised the courage of Oketra and the brilliance of Kefnet. My gods are magnificent, Hapatra thought in wonder. Samut and Djeru hugged each other tight, and clapped Hapatra on the back. Hapatra refused to share their tears of joy. She would have time to herself later for that. But as she contemplated how she would mourn the passing of Rhonas, the dust and particles that once were the form of the scorpion god began to shift. The pieces lifted from the ground and, within moments, reconstituted the very beast that had been killed only just before. The beast rose whole and uninjured, as though the battle that had shaken the earth beneath the thoroughfare mere moments before had never happened. Kefnet turned back toward his fallen foe only to find the scorpion god facing him dead on, its vile chittering the last thing Kefnet heard before its stinger pierced the middle of his forehead. The wound was neither deep nor wide, but the beautiful and brilliant Kefnet, God of Knowledge, was dead before he hit the ground. Hapatra screamed, and Samut and Djeru did the same, their hearts aching once again with the loss of a god. Oketra hissed with fury, firing her arrows in an act of futility. "Mortals! Flee to the safety of the mausoleums!" Oketra cried. Hapatra halted for a moment. What mausoleums? She ignored the command and yelled to Samut and Djeru sitting behind her, "Get off now!" The two did as they were told, and Hapatra dug her heels into Tuya to urge the basilisk forward. The serpent spat its venom, weaving itself around the scorpion god and gnashing its venomous jaws. Hapatra gripped tightly with her thighs and pulled the basilisk in a sharp turn, urging her mount toward the enemy. The blood of Kefnet had spilled over the stone in the courtyard, and Tuya slid as she tried to grapple with the scorpion god. Hapatra kept a firm grip on Tuya's scales and silently urged her familiar forward. Her heart ached with the pain of Kefnet's death, but she shoved the hurt as far deep as she could. This trespasser needed to die, and it would be at her hand. Oketra leapt between the basilisk and the scorpion god. Hapatra's chest cramped in pain. She looked up, and she cried out in horror. Directly above her, the scorpion god's stinger was lodged in Oketra's gut. Hapatra screamed and heard an unfamiliar voice shout in grief at the same time. Gideon stood on the opposite end of the courtyard, his face the very picture of anguish. She and the basilisk froze in fear as the scorpion god stepped over the two of them. It looked to the sky, seeking something, and proceeded on its way through the streets of Naktamun, ignoring the mortals in its wake. The thoroughfare was empty, and two of Hapatra's gods lay dead in front of her. For the first time all day, she openly wept. She wept for the death of her god. She wept for the death of her pantheon. She wept for the children forced to fight and the men devoured by locusts and the beloved serpent that shivered with fear under her hand. Her grief cascaded over the levy of her control and sent her into the arms of a champion and a heretic. Djeru and Samut held the vizier as she sobbed, and they, too, mourned their many losses. Other citizens, survivors one and all, came out of alleys and hiding places to see the bodies of the gods. Hapatra gasped for air through her grief and saw Gideon standing still over Oketra. She composed herself and nodded to Samut and Djeru, who let go of her shoulders and allowed her to cross to Gideon. Hapatra looked down her nose at Gideon. Her cheeks were stained with teary kohl, and her lips twitched in a deadly combination of grief and fury. "The source of this hell is a trespasser like yourself, isn't it?" Gideon swallowed hard and nodded. Hapatra glared and spoke with a voice that dripped with venom. "Then he is your responsibility to kill. Be done with your task and get out of my city." The master of poisons turned away and approached Samut and Djeru, her sandals stepping through the ichor of gods. She looked at them both with resolution in her eyes. "We must find Bontu and Hazoret and keep them alive at all costs. They are all we have now."